In 1900, one of the most profound thinkers of his day was buried in a small town in Germany. He had been sick for over a decade before his death as a side effect of a mental breakdown. Fortunately, in the years before that, he sealed his legacy with an impressive library of work. Friedrich Nietzsche is a name that evokes passion even today. His writing touched on almost every aspect of the human condition, and many of his aphorisms are still widely quoted. And yet, there are few figures in modern history that are as misunderstood as Nietzsche. The connotation that the average person associates with his name is one of nihilism, or meaninglessness. His often repeated phrase “God is dead” has consistently been taken out of context, and many of his ideas have been negatively reframed by second-hand sources. The truth is that Nietzsche’s real concern was to define a framework for meaning in a world that was seeing a trending decline in religion. He was actually aggressively against nihilism. While not always timid or utterly nuanced in his approach, it’s a shame that much of Nietzsche’s work has remained elusive to the general public. There is a lot of wisdom and insight in his writing, and his big ideas are worth understanding, whether or not you agree. Different ideologies have different opinions on what the fundamental motivation is for life. Evolutionary theory suggests that it’s nothing more than survival and genetic endurance. Many religions lean towards a belief system that prefers the idea of heaven as a destination. In psychotherapy, three schools of thought dominate. Will to pleasure, which is inspired by the beliefs of Sigmund Freud. Will to meaning, which stands on the work of Viktor Frankl. Will to power, which was championed by Alfred Adler, but initially introduced by Nietzsche. The will to power was central to much of Nietzsche’s work, and it evolved over time. There is a fair degree of disagreement over what he meant, too. Some argue it was a metaphysical position (nature of reality), others that it was an epistemological position (relating to knowledge), but the most common interpretation is psychological. To Nietzsche, power had a broad definition that involved a sense of mastery over oneself, the environment, and our relationships. He believed that this is primarily what dictates our behavior, and to live meaningfully is to align this will to power with actions and intentions. Many people immediately feel discomfort with this idea, especially as it relates to other people because they automatically associate power with politics, war, and oppression. That’s not the only way to look at it. Increasing power over yourself can be about controlling emotions. Increasing power over the environment may be about opportunity and optionality. An increase in power over others is more often a product of kindness than it is violence. The will to power exists in our behavioral patterns in one way or another, but the way that it manifests depends on the choices we make and the things that we choose to value. The degree to which your will to power hurts or benefits you or the people around you depends on the context within which you frame it. Luckily, that’s entirely up to you. The “Übermensch” is one of the most famous and most misunderstood of Nietzsche’s ideas. It was misused by the Nazis during the Second World War to further their own agenda, and given that the word roughly translates to “Superman,” it’s still painted in a poor light. A more accurate translation has been suggested to be self-overcoming or self-mastering. While the term is introduced only once in Thus Spoke Zarathustra, it’s essentially what the entire book was written about. 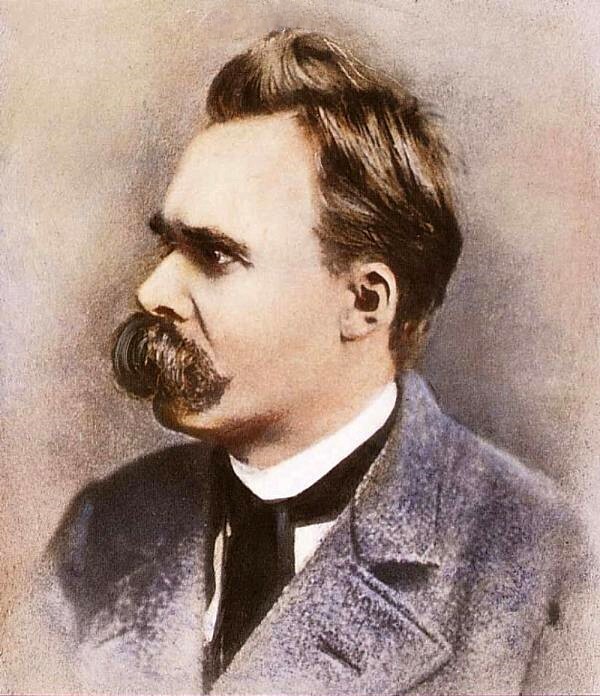 To Nietzsche, the Übermensch was an ideal end for people to strive towards, and to get there, we would first have to overcome and master our current self. In a world losing its connection to God and religion, he saw a need for us to create our own values to live meaningfully. But to do that, we would first need to envision a better and more advanced being than our current selves as to give us a significant aim. There is still debate about whether or not Nietzsche’s idea of the Übermensch was referring to a singular ideal for the individual or a collective goal in the future for humanity as a whole. It can also be interpreted subjectively. For a musician, this may mean self-overcoming their own doubt to strive towards the ideal of a fearless artist. For a designer, it could be about self-overcoming their creative challenges to strive towards the ideal of a product visionary. Either way, it boils down to there being an image towards which it’s worth striving. An image that motivates the values we hold and the context in which we frame our will to power. 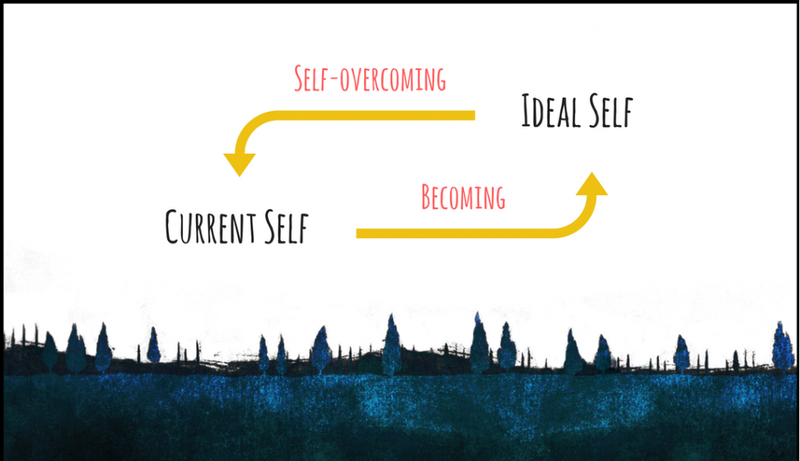 The idea of self-overcoming is less about a sudden change than it is about an ongoing personal transformation. The point is to give the journey of evolution a form of meaning. Many people have goals and ideas for success that they envision, but they seldom have an improved identity that they look to evolve into. The latter may just be more important. Sooner or later, every philosopher stumbles onto the problem of suffering. We all face pain over the course of our lives because it’s nature’s way of telling us that something is wrong. At times, this is caused by physical damage to our bodies, which is understandable. If something is hurt, we want to know about it, and a feeling of pain forces us to react. Much of the time, and more frustratingly, however, it’s a product of how we interpret the events in our life. This is also important, but this kind of suffering can be unbearable. It can occur in response to a significant event, like losing a job or the death of a relative, or it can persist even without any major external stimuli, when struggling against a goal or in moments of doubt, for example. It demands an action, but it doesn’t always just go away. Arthur Schopenhauer, one of the big influences on Nietzsche, had a very pessimistic view of human life precisely for this reason. He couldn’t find a logical link between meaning and the adverse effects of suffering, and he believed that we were doomed to the human condition. Nietzsche, however, saw things differently.He liked to point out that the only problem with suffering is that we automatically label it as bad. We see it as something to avoid even though the rational function of pain is to make us stronger. It’s actually good for us. In fact, pain is quite often the fuel that strengthens you to really fight for self-overcoming. Exceptions exist, but they’re unique. The more you fear pain, more problematic it becomes. The more you treat it for what it really is, the more you can use it to augment yourself. Whether you’re religious or not, it’s worth comprehending the different frameworks that humanity has developed to understand and derive meaning out of their place in the world. In the last 200 years, there is perhaps no one whose philosophy has been as influential as Friedrich Nietzsche. Although misunderstood, he has a lot to teach us. A world devoid of meaning of any kind is quite a dull one indeed. Few people have found extended joy and fulfillment in refusing to establish their own narrative into a larger one. Different people find comfort in different things, but in the end, it’s about living life with intent.